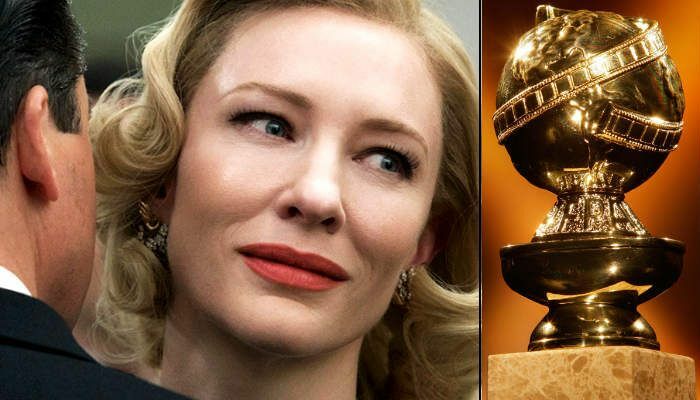 Carol, a 1950s lesbian romance starring Cate Blanchett and Rooney Mara, has led the Golden Globe nominations with five nods including for best drama and best actress where both the co-stars will be competing with each other. The nominations also saw The Big Short, Leonardo Di Caprio-starrer The Revenant and Danny Boyles Steve Jobs garner four nominations each. Blanchett, already a double Oscar winner, is being considered an Academy award front-runner in the best actress category for her performance in the Todd Haynes-directed film, which is based on the best-selling novel The Price of Salt. The movie has been nominated in the best motion picture drama alongside Mad Max: Fury Road, The Revenant, Spotlight and Room. Nominees in the best actress - drama are Brie Larson (Room), Saoirse Ronan (Brooklyn) and Alicia Vikander (The Danish Girl). In the best actor - drama category The Revenant star DiCaprio will fight it out with this years Oscar winner Eddie Redmayne for his gender bending role in The Danish Girl. Michael Fassbenders turn as Apple co-founder Steve Jobs is also a strong contender in this category and so is Bryan Cranstons performance in the role of a blacklisted Hollywood writer Dalton Trumbo in Trumbo and Will Smith for sports thriller Concussion. In the best motion picture - musical or comedy category, the nominees include The Big Short, Matt Damon-starrer The Martian, Jennifer Lawrences Joy, Spy and Trainwreck. Lawrences turn as the magic mop inventor in Joy will fight it out with McCarthys Spy, Amy Schumer for Trainwreck, Maggie Smith for The Lady In The Van and Lily Tomlin for Grandma in the best actress - musical or comedy list. The Big Short co-stars Christian Bale and Steve Carell along with Damon (The Martian), Al Pacino (Danny Collins), Mark Ruffalo (Infinitely Polar Bear) are vying for a Golden Globe in the best actor - musical or comedy category. The awards will be handed out on 10 January in Los Angeles. Happy Birthday Dilip Kumar. But, why is he not celebrating his 93rd birthday?